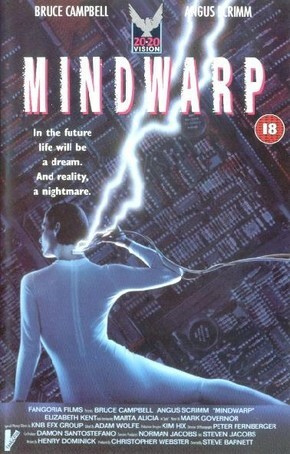 The boys really searched through the proverbial video store racks for this week’s pick, the little known and probably even less-seldom seen sci-fi treat, Mindwrap from 1992, starring Bruce Campbell and Phantasm‘s Angus Scrimm. This underrated, low-budget post-apocalyptic/technological/CHUD-style tale explores themes probed 7 years later in the highly popular 1999 film The Matrix (though the viewpoints of the filmmakers couldn’t be more carbon opposite), and Mindwrap seems to be an amalgam of some of the best sci-fi films out there, e.g. The Time Machine, Total Recall, Blade Runner and THX 1138. So please have a listen and enjoy us waxing over a true forgotten sci-fi and Bruce Campbell classic!